Australia is a large country and our climate varies greatly. 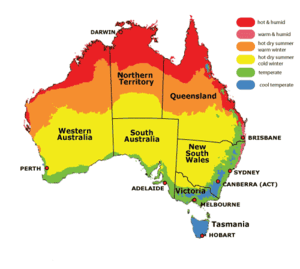 The Northern and Outback Regions of Australia can be extremely hot and humid around our summer months. The far north have a wet summer season that can cause road closures in some areas. For most people, the most comfortable time of the year to visit the northern regions of Australia is from April to September. Generally upwards of Broome, Darwin and across to Cairns. It is best not to do any walks or strenuous activities during the heat of the day. Wear a hat, sunscreen, a good covering shirt and take plenty of water along with you. In the Southern areas of Australia, the weather can also vary greatly. It is always a wise move in the southern areas of Australia to keep a jumper or jacket handy. I have seen many people - Australian and overseas travellers caught out by the changes in the weather. The Australia Bureau of Meteorology provides a range of weather forecasts that can assist you in planning your trip. One of the most important elements of planning your trip is to allow enough time to travel the long distances in Australia. Many people under estimate the distances between our major cities and towns. 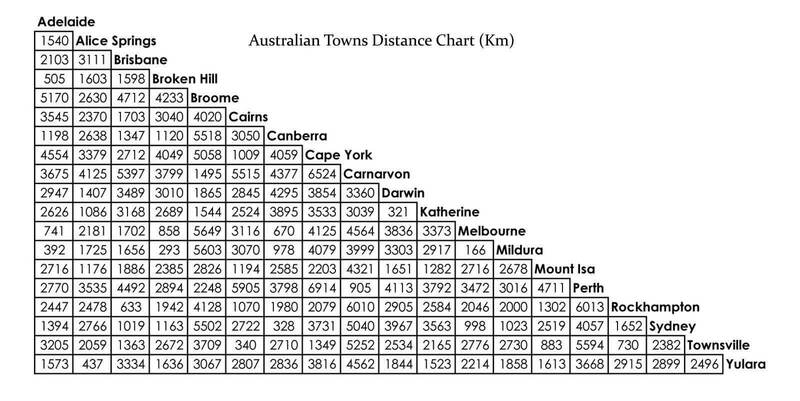 The distance chart below outlines the kilometres between the major cities and towns. Take the time to really plan the distances that you have to travel between each major town and city and plan your fuel stops. Not everywhere in the outback has fuel, so plan your drive with care - carefully consider taking extra fuel and water with you when travelling into the outback. With a bit of time spent planning your drive, you will enjoy your trip so much more. Make sure you stop every 2 hours for at least a 15 minute break. Dial 000 for Emergency Services - this number is used througout Australia.